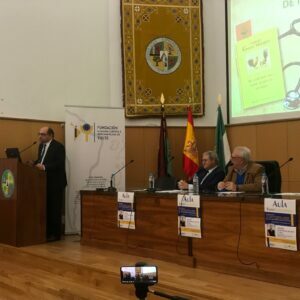 The European and Ibero-American Academy of Yuste Foundation has organised a conference on “Los médicos de Macondo. La medicina en la obra de Gabriel García Márquez” (The Doctors from Macondo. Medicine in the work of Gabriel García Márquez), which will be given in the Assembly Hall of the University of Plasencia on Thursday 28th at 5pm by the Doctor of Medicine and Professor of the History of Medicine and Nursing from the University of Cádiz, Juan Valentín Fernández de la Gala. This talk is part of the Aula Euro-Iberoamérica programme started up by the foundation, so that Extremaduran universities can complete their training with contributions made by experts in different fields such as social, economic and cultural etc. Fernández de la Gala, who will be presented by the director of the foundation, Juan Carlos Moreno Piñero, will present a study that is going to be published shortly titled “Los médicos de Macondo” (The Doctors of Macondo) on medicine and its professionals in the work of the Colombian Nobel laureate, “either in the character sketches, in the hyperbolic pathologies, in his wonderful diagnoses, or in the reference to treatments of deep indigenous and historic roots”. The doctors, illnesses and death itself have played a prominent role in Gabo’s work like a continual source of inspiration and amazement, revealed Fernández de la Gala. “His father, Gabriel Eligio García, practiced as a homoeopath for many years with inconsistent success, and ran chemists in several villages in the north of Colombia. As for García Márquez himself, he was a door-to-door salesman of medical books and encyclopaedias round the villages of Valledupar and La Guajira,” explained Juan Valentín Fernández de la Gala. The conference, which is admission free while places are available, will bring medicine closer to the attendees through the Gabriel García Márquez’s literature, building a bridge between science and humanities. Born in Campillo de Llerena, Fernández de la Gala has a degree in Medicine and Surgery from the University of Seville; M.D. from the University of Cádiz and holds postgraduate qualifications in Anthropology and Biology from the Complutense University of Madrid and Expert in Forensic Anthropology from the University of Granada. He has been intensely dedicated to the research of the history of medicine, and particularly to the study of skeleton remains from prehistoric cemeteries associated to megaliths, and others from the Roman and Medieval era. With this biological data, he tries to rebuild the profile of health and sickness of the ancient settlements. He has given numerous conferences on these subjects in Spanish and American universities, and has obtained over a dozen awards for his literature and research. He was Assistant Director of Panacea magazine up to 2017 for translation and medical lexicography, a corresponding member of the Royal Academy of Medicine and Surgery of Cádiz and a corresponding member for Spain in the North American Academy of the Spanish Language. Since 2009, he has been an Associate Professor of the History of Medicine and Nursing in the Faculty of Medicine in Cádiz.